Egyptian President and Saudi King say the Palestinian cause remains the central cause of all Arab countries. Egyptian President Abdel Fattah Al-Sisi and Saudi King Salman said on Sunday that the Palestinian cause remains the central cause of all Arab countries, the Palestinian Authority’s official Wafa news agency reports. 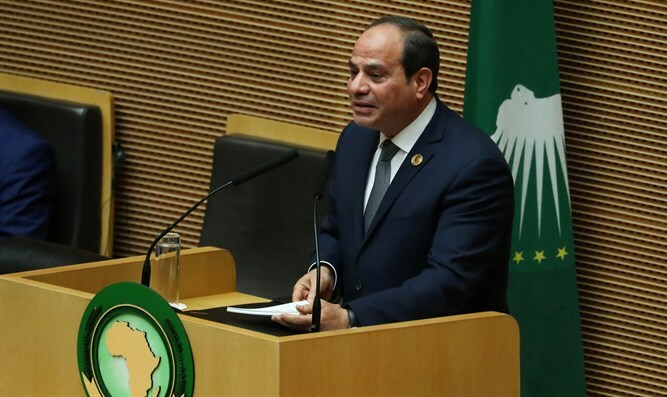 "Shared challenges have been embodied in the hotbeds of conflict in the region, foremost among them the Palestinian cause, which is the central and primary cause of the Arabs," said Sisi said during his speech at the Arab League-European Union summit being held in the city of Sharm el-Sheikh in Egypt. He added that the Palestinian cause is one of the main roots of the regional conflicts. "I cannot but warn of the repercussions of the continuation of this conflict on all our countries," said the Egyptian president. Saudi Arabia's King Salman asserted the importance of the Palestinian cause, praising EU countries' stances on the issue. "The Palestinian cause is a priority for Arab states, and efforts should be made to retrieve the rights of the Palestinian people," he said, according to Wafa. Egypt became the first Arab country to sign a peace treaty with Israel in 1977. Jordan was the second country to sign a treaty with Israel, with that treaty having been signed in 1994. There have been indications that Israel is getting closer to other Arab countries, including Saudi Arabia, though Saudi officials have repeatedly dismissed this idea. Saudi Prince Turki Al-Faisal, a senior member of the Saudi royal family, recently told Channel 13 News in an interview that Prime Minister Binyamin Netanyahu is deceiving the Israeli public when he claims that relations between Israel and Saudi Arabia can improve without progress in the peace process with the PA.
Saudi Arabia’s Foreign Minister, Adel Al-Jubeir, said last week that Saudi Arabia had made clear its position regarding the Israel-Palestinian Arab conflict and that the solution must be based on the Arab Peace Initiative. The Arab Peace Initiative, unveiled by Saudi Arabia in 2002 and re-endorsed at the 2007 Arab League summit, stipulates that 22 Arab countries will normalize ties with Israel in return for an Israeli withdrawal from Judea and Samaria. The Arab League-European Union summit is made up of 28 European countries and 21 Arab states who will meet for two days to discuss joint challenges and boost mutual cooperation opportunities. It comes as the US continues to work on its peace plan for Israel and the PA, which will be officially made public after the April 9 election in Israel. The PA has rejected US attempts to restart peace talks with Israel and has been boycotting the US ever since Trump’s recognition of Jerusalem as Israel’s capital in December of 2017.